Find yourself drawn in by the allure of one of Asia’s most mysterious countries on this journey into Myanmar. This 14 day tour takes in Myanmar in all its diversity, from the glistening spires of Yangon’s Shwedagon Pagoda to Golden Rock, visiting the floating gardens and stilted monasteries of Inle Lake and ethnic tribes, the atmospheric pagodas of the forgotten capital, Bagan, legendary Mandalay and relaxing at famous Ngapali beach. 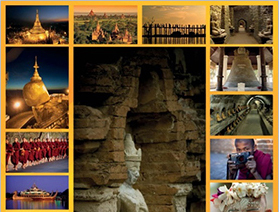 Leaving Yangon in the morning, enjoy a scenic journey by road to Golden Rock (Drive via Bago: 194 km – 5 hours). Late morning, arrive at Golden Rock base camp and transfer to transit junction with one of the small open trucks in a one hour ride. The ‘upper area’ must be traveled by foot, at present, and the walk is approximately 4 km (1 hour). Once at the pagoda, you can enjoy a spectacular view, which is particularly beautiful at sunrise or sunset. The whole site has a magical feeling. Overnight in Goldenrock. Early sunrise time, strolling around the hill sites & return to hotel & breakfast there. Then back to base camp by the truck. Arrive base camp, continuous drive to Bago, an ancient Mon capital city. On arrival in Bago, visit to local market. Continue visit to over a thousand years old, Shwemawdaw Pagoda. Proceed to Shwe Tha Lyaung Pagoda, reclining Buddha, which is among one of the country’s most impressive image statue, is 180 feet long and 52 feet high. Then proceed to Yangon on the way sightseeing at Allied War Memorial Cemetery. In the morning drive (45 km drive) to Mount Popa, an extinct volcano with spectacular views, 4981 feet above sea level. 777 steps lead up to the Buddhist shrine place on the top of the Popa peak. On the top of mountain there are monasteries, pagoda and shrines indifferent styles. In the late afternoon back to Bagan. Then transfer to jetty where a private wooden river boat is waiting. Sitting under the shade or on the open-deck you’ll be treated to fabulous views as you cruise down the Irrawaddy River to Shwezigon Pagoda. You’ll pass by small villages on the river banks, fishermen, local boats and of course many riverside temples. The views of Bagan are spectacular and a different perspective from the usual sightseeing. Morning flight back to Yangon. Then enjoy a visit to Scott Market, the sprawling 75-year-old Market. At the market you will find a whole variety of interesting Burmese souvenirs, from lacquer ware to gems & jewelry – bargain at the stores to fully experience the Burmese market atmosphere! Drive through the city and observe the influences of other cultures in the region. Intersperse in the tour are various religious sites such as the St Mary’s Cathedral, built in 1899, and the Buddhist landmarks of Sule Paya and over 100 year old beautiful Rangoon Synagogue. In there you will have the opportunity to meet with Trustee of the Synagogue to learn the Jewish Life in the Pagoda Land. Then visit Little India and Chinatown – stop to greet the vendors and let them introduce you to their wares – some familiar, some exotic.